I think every girl wishes for long, luscious, thick hair. Some are lucky. Other have wispy thin hair... myself included. It has been a lifelong battle to work with my thin hair to make it look voluminous and to grow it longer. 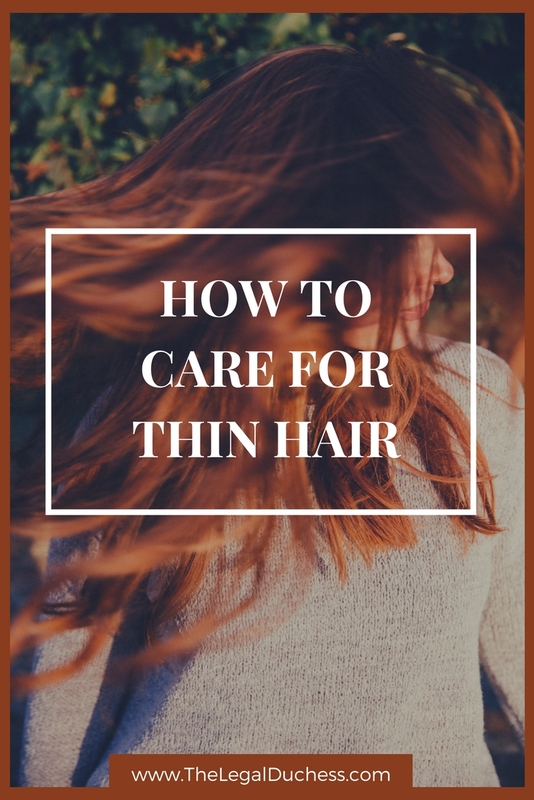 I finally have a system that truly works so I am sharing it in the hopes it will help other thin, fine haired ladies out there. Beauty starts inside so I make sure I am eating and drinking things that will help my hair grow. I take a gummy vitamin every morning specially made for hair, skin and nail health. I have noticed a significant difference in my hair and nail growth. Also, vitamins are never a bad idea in general so what can it hurt? These are a great price and do the trick very nicely. Thin hair cannot be washed and treated in the same way as thick hair. If you do not wash often enough, it gets super oily. Too much washing dries out the scalp and causes dandruff. There has to be a happy medium. I wash my hair about 5x a week to keep from drying it out but I have to keep it from getting oily. Dry shampoo is my BEST friend for my oily hair and helps me to skip a few washes. To combat the dry scalp and dandruff, I use a paraben free Tea Tree Shampoo. Tea tree is great for itchy, dry scalp and it seems to keep the dandruff away. For conditioner, I use something light and I do not condition at the roots because that causes it to be flat and oily. I love Costco brand conditioner but when that is not available, I use this as an alternative. About once a week I use a deep conditioner to try to strength my thin locks. I have tried SO many products over the years and I have probably thrown 95% of them away because they just do not work. I finally hit upon great products that do what they claim. The Kristin Ess collection at Target is amazing. The quality of the products for the prices is unbeatable. I use the Weightless Shine Leave In Conditioner spray after showering to detangle, add shine, and shield my hair from heat damage. I then use the Instant Lift Thickening spray on my roots to gain some body and volume in my thin hair. Lastly, I finish off my hair style with the Refine Signature Finishing Spray which provides a light hold and brushable finish. These products do not weigh down my thin hair and they do what they need to. I am hooked!! My thin, fine hair is so tangled. I have struggled for years with brushing it out and finally the hair gods smiled upon me and I found this miracle brush. Game. Changer. You can buy them almost anywhere and they work SO well. Go buy one. Or three. Now. Thin hair can be a struggle to style in any way except for straight. Thin hair is also more susceptible to heat damage. Using the right products will help to style without ruining your hair. I use a CHI Flat Iron and it is seriously the best. Don't believe me? Check out this research on the best Flat Iron from Reviews.com. They agree- CHI is one of the best on the market. I also have a Hot Shot Tools Curling Wand. I was always unable to curl my hair successfully and have it stay until I found this superstar. I curl in the morning, spray on one coat of finishing spray and the curls or waves will hold for days. Seriously it is the greatest thing ever. I avoid blow drying my hair as much as possible but when I absolutely have to, this is my go to blow dryer. Though it seems odd, it is actually best to cut your hair more often to keep it healthy and growing. I usually go to the salon 4 times a year for a trim and fresh highlights. In my experience, layers help to add some volume to my hair but only when done right. So be particular with your stylist. There you go, all my times for caring for your thin hair. It is not always easy but you live with what you have.